Earlier this week I shared five ways to create animated movies on Chromebooks. Creating animated movies can be a lot of fun for you and your students. But sometimes you just need a short animation to get your point across or to remind students about an important point. That's when the following three tools are handy. Flip Anim provides possibly the easiest way draw and create an animated GIF. In the following short video I demonstrate how to create animated GIFs by using Flip Anim. Loopy is a free tool for creating your own animated simulations or illustrations of a concept. This free animation tool is designed to showing relationships between two or more parts of a system. It's perfect for showing cause and effect or for showing a workflow system. To create an animation on Loopy you simply have to click on the blank canvas to place a circle that represents the start of a system. Then click on the canvas again to add another element to your system animation. To connect the two (or more) pieces you use a drawing tool to connect them. 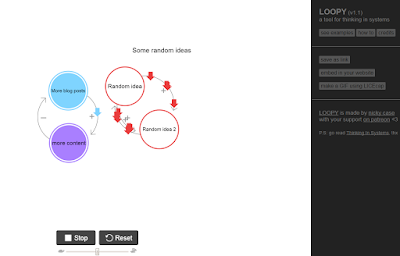 Once you've drawn the connections you can add cause and effect commands by selecting them from the Loopy editor.